Sometimes you just need a break from the grind of dieting. 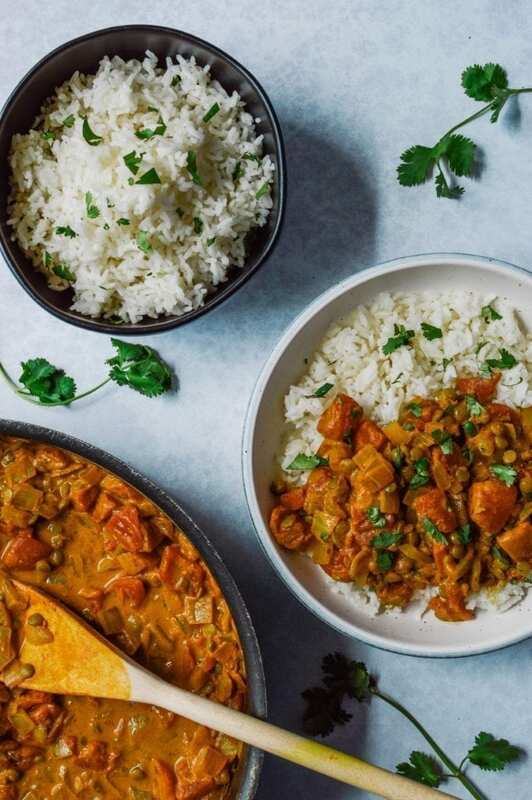 You crave a meal that excites you and your taste buds. Something that brings you so much joy, you can’t wait to eat it. Does that statement speak to you? If so, it’s time to dig into my Loaded Vegan Nachos. Hallelujah! 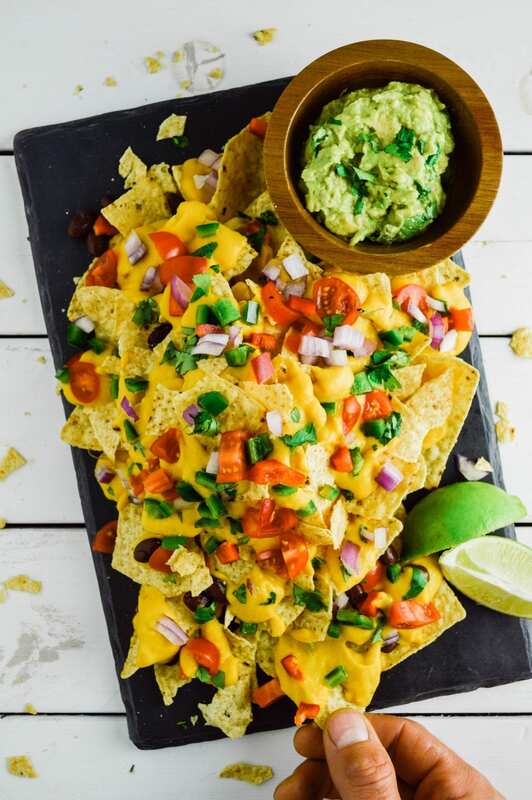 Bust out the Corona, kick up your feet and dig into the cheesy, nacho deliciousness below. 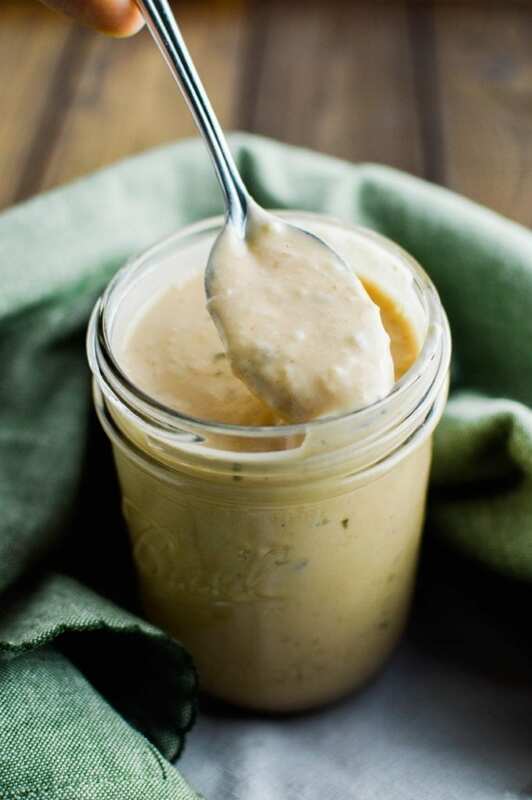 Start prepping this recipe by making the Vegan Jalapeño Queso sauce. 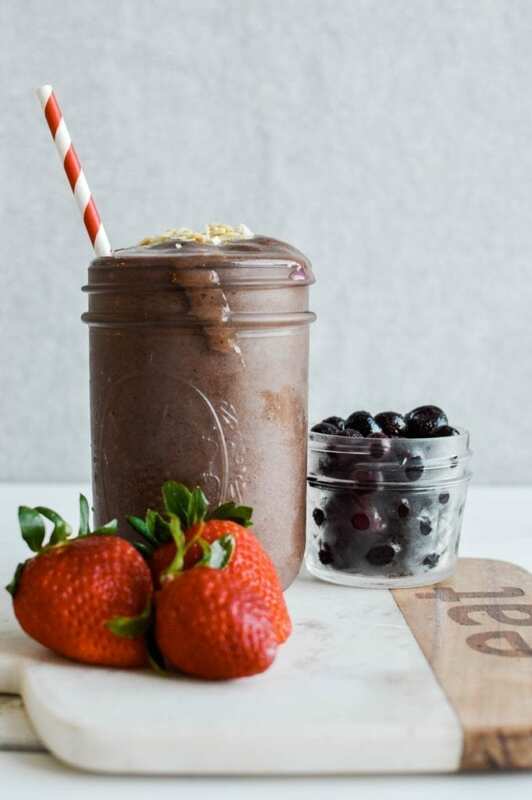 This requires boiling potatoes and carrots, then blending those and the other ingredients in a high speed blender (like a Vitamix). During the boiling, you can prepare both the ingredients for the rest of the queso and the nachos. Simply, chop the veggie ingredients and heat the beans. 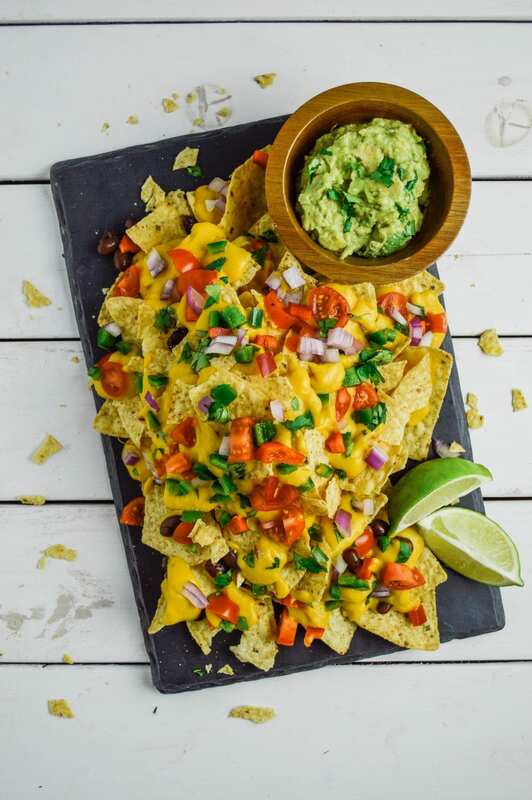 Since most of the flavor for these nachos will come from the queso itself, the only additional seasoning you’ll need is salt! Once the sauce and nacho ingredients are prepped, it’s time to layer. 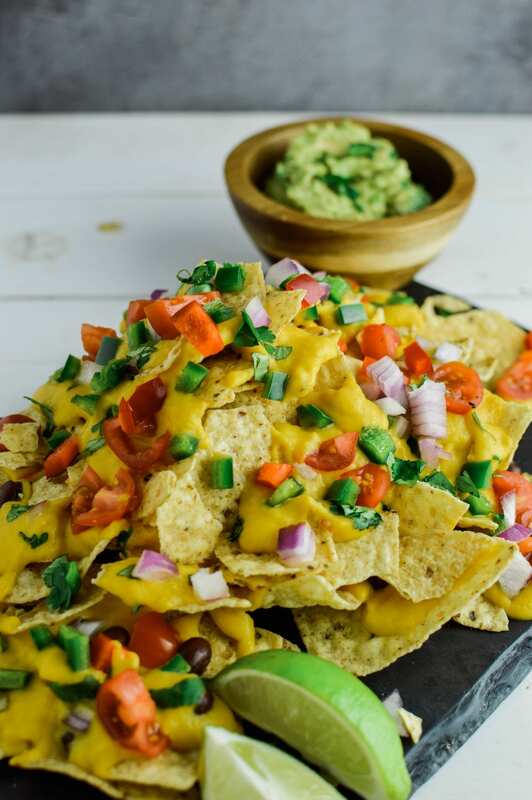 This is the one step you don’t want to skip because the whole nacho experience revolves around the cheesy goodness melted on the chips! 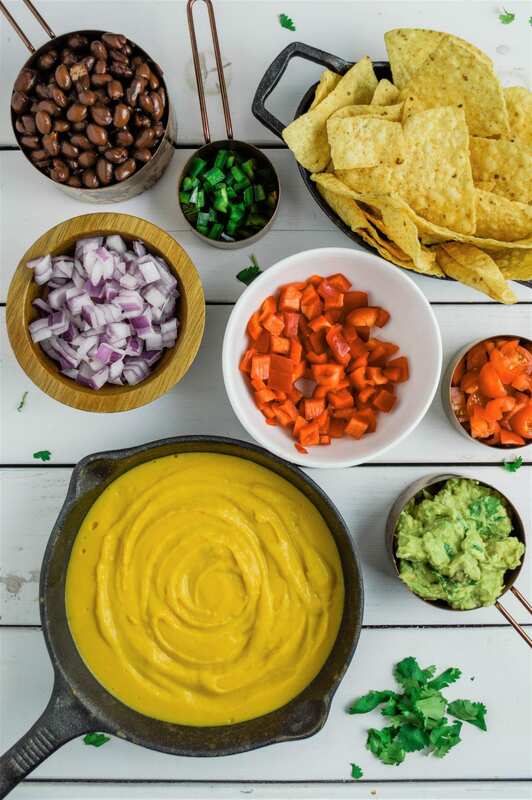 To layer the nachos for maximum flavor, add 2 cups of the chips to a large platter, plate, or bowl. Then, add a couple of spoonfuls of the additional ingredients over top the chips and cover with a helping of Vegan Jalapeño Queso. Repeat that step until you have a plate piled high with nachos. If you’re a guacamole fan like me, add a dollop to the top. 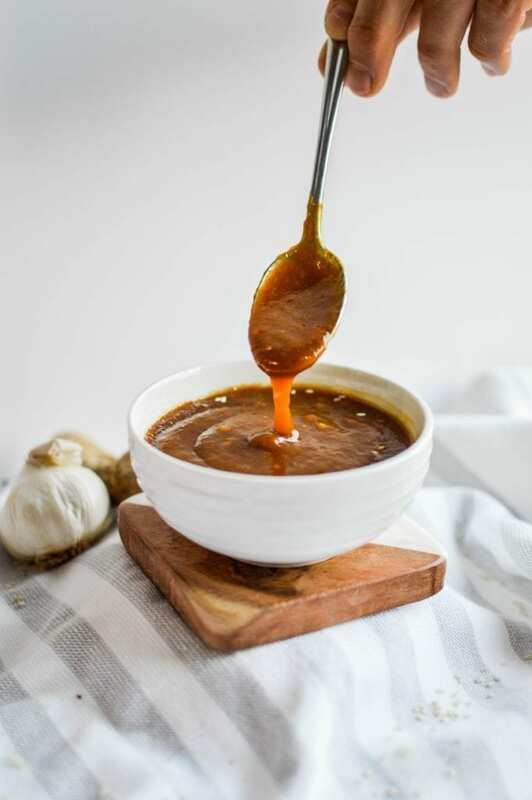 You can also add salsa, extra cilantro, and hot sauce if your heart desires. 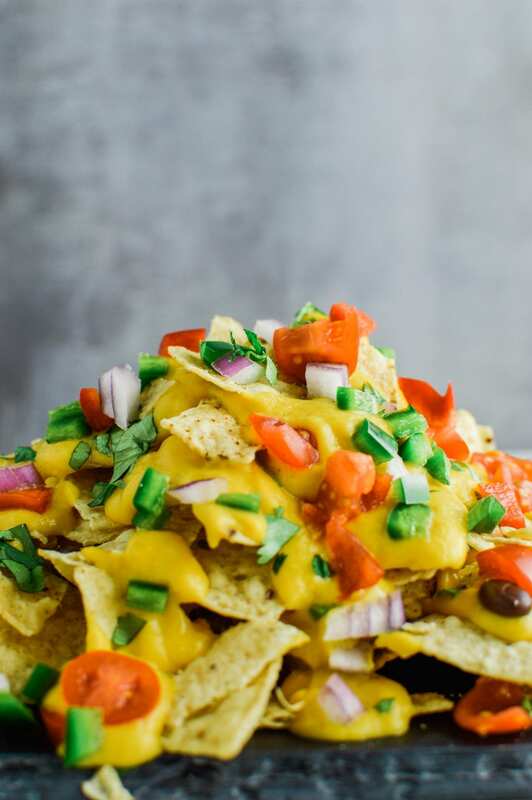 Make it yours and enjoy these Loaded Vegan Nachos! Want More Mexican Food in Your Life? The cheese should be hot enough to serve right away. However, if it needs reheating, microwave for up to 60 seconds, checking at the 25-30 second mark. It will need to be whisked to prevent excessive thickening. Quick guacamole – 2 avocados mashed + 1/4 tsp sea salt + 1 tbsp lime juice. Start by preparing the Vegan Jalapeño Queso. Once that's finished, heat the black beans in the microwave (60-90 sec) or on the stove top (four minutes on medium heat). Now, two cups of chips to a large plate, platter, or bowl. Then, add a spoonful or two of each ingredient onto this first level. Cover with a large drizzle of queso. Repeat step three until you've piled your nachos to the ideal height. Top it with guacamole, salsa, and/or hot sauce. Enjoy!